The File Compare action allows you to compare two files and use the result to influence the flow of your project. For more advanced comparison options, you can use the (third party) Beyond Compare actions or Araxis Merge actions. 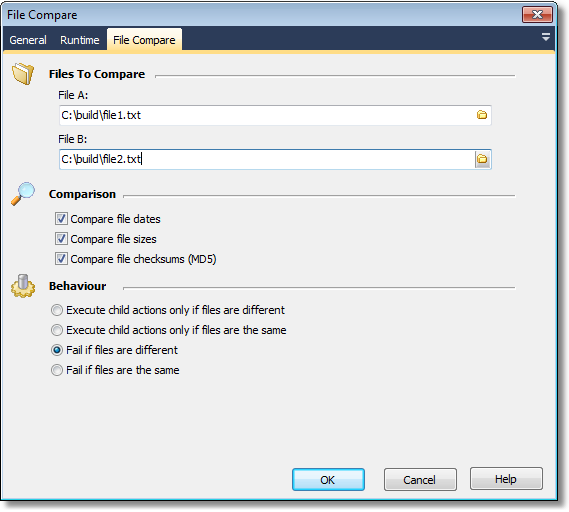 Specify the file names of the files to compare. Tip: Use File Iterators to compare multiple files. Select one or more methods by which to compare files. "Compare file checksums" is the most accurate. If this option is set, the action will compare file modification dates to determine if the files were modified at different times. Note that dates are considered different if they are more than a millisecond apart. If this option is set, the action will generate an MD5 checksum to determine if the files are different. Although MD5 checksum collisions can occur, this option more or less guarantees whether or not the file contents are identical. Choose how the result of the comparison will influence the flow of the project. You can choose to have the action only execute its child actions if the files are different/the same, or alternatively have the action fail outright if files are different/the same.